As “they” (Tomoya & Co) meet up in the drama club room, they talk again about graduation. However, Nagisa suddenly feels unwell and faints. Tomoya takes her home and realises she’ll be ill for a long time again and starts to feel depressed. He also learns that Nagisa won’t be able to graduate with him this year as she’s too ill to take the exams. Okazaki tells Sanae and Akio that he can’t accept it however Akio tells him he’s behaving like a kid and that he should push forward. 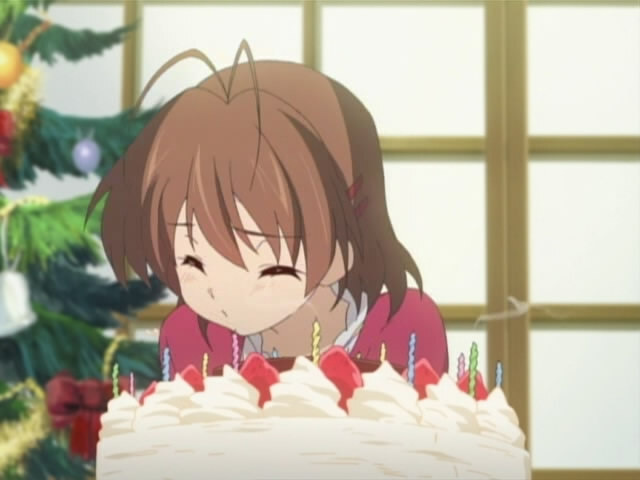 As Christmas Eve finally arrives, they all go and celebrate Nagisa’s birthday and give her a really big Dango. She thanks everybody with tears in her eyes T^T. This entry was posted on November 29, 2008 at 9:10 pm and is filed under Anime, Clannad ~After Story~ with tags 9, Anime, Clannad After Story. You can follow any responses to this entry through the RSS 2.0 feed. You can leave a response, or trackback from your own site.